International Space Station cameras monitor the H-2 Transfer Vehicle 1 before the Canadarm2 releases it on Oct. 30 2009. Japan?sfirst unmanned space cargo ship cast off from the International Space StationFriday as it nears the end of a successful maiden voyage. Astronautsaboard the station used the outpost?s robotic arm to pluck the spacecraft, calledthe H-2 Transfer Vehicle 1 (HTV-1), free from an Earth-facing mooring and letit go at about 1:30 p.m. EDT (1730 GMT). 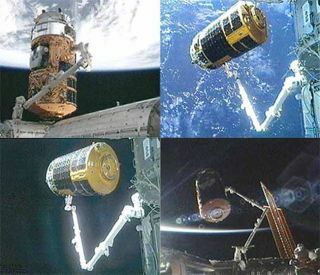 The HTV-1is the first in a new line of Japanesespace freighters to haul tons of supplies for astronauts aboard the spacestation. It is the latest addition to an international flotilla of unmannedspace cargo ships for the station that includes Russian and European vehicles. But theHTV-1 is currently the only freighter capable of delivering cargo for useinside the station, as well as new experiments and other equipment for theoutpost?s exterior. It is due to fire its thrusters on Sunday in order to beginan intentional death plunge into Earth?s atmosphere over the Pacific Ocean. ?We?d liketo thank everybody across the planet for this beautiful vehicle,? NASAastronaut Nicole Stott radioed Mission Control as HTV-1 left the station?svicinity. ?It was pretty much flawless from beginning to end.? NASA delayedthe departure of HTV-1 from the station by one orbit - about 90 minutes -in order to be sure a piece of Russian space junk would not pose a risk to thespacecraft. The debris, part of a defunct Russian satellite, posed no danger tothe space station and its crew, but could have posed a threat to the HTV-1 onceit entered a different orbit later today, NASA officials said. The JapanAerospace Exploration Agency (JAXA) launchedthe HTV-1 in early September using its brand-new H-2B rocket. Bothspacecraft functioned perfectly during the spaceflight debut. A mission controlcenter in Tsukuba, Japan, watched over HTV-1?s weeklong trek to the spacestation. Thegleaming HTV-1 is a gold-colored cylinder about 33 feet (10 meters) long, 14feet (4.4 meters) wide and covered in solar panels attached to its curved hull.It is capable of hauling up to 6 tons of cargo to the space station, butHTV-1 carried about 4 1/2 tons of supplies on its maiden flight, NASA officialshave said. HTV-1 arrivedat the space station on Sept. 17, when Stott and her five crewmates plucked itfrom space using the station?s robotic arm. They packed it with nearly 1,600 pounds (728 kg) of trash before discarding the disposable spacecraft Friday. UnlikeRussian and European cargo ships, which can fly themselves up to the spacestation autonomously, HTV-1 is designed to be grappled by the station?s arm.NASA hopes to use a similar method for securing future commercial cargo shipsbuilt in the United States. JAXAofficials said Japan spent about $220 million to build HTV-1, but thespacecraft?s development has cost an estimated $680 million since 1997. TheJapanese agency plans to build at least one new HTV a year, they added.